Markets are rallying in the wake of some big central bank gestures. Currently, the Dow is up 64 points (0.4%), the S&P 500 is up 8 points (0.4%), and the Nasdaq is up 15 points (0.3%). Friday came with two big central bank moves. The first big move came from European Central Bank President Mario Draghi, who spoke to a banking conference in Frankfurt at about 3:30 a.m. ET. Draghi spent some time discussing how the ECB is able to stimulate the economy and prices via its purchases of bonds on the market. 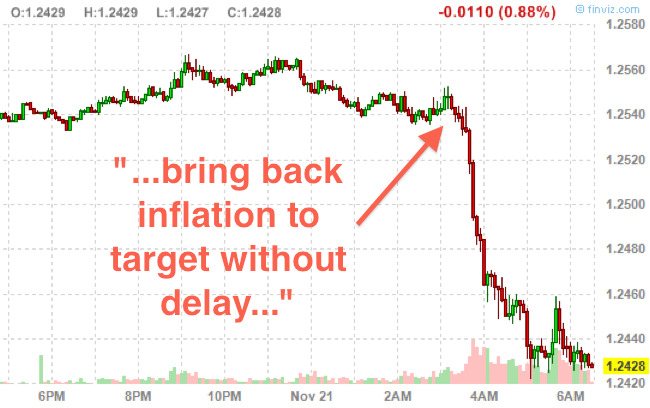 The euro immediately tanked on Draghi’s dovish words (see chart above). France’s CAC is up 2.6%, Germany’s DAX is up 2.6%, and Spain’s IBEX is up 30%. The second big move came from the People’s Bank of China, which announced interest rate cuts at about 5:30 a.m. ET. This was the first time the PBoC cut rates since July 2012. FinVizThere goes the Aussie dollar. The one-year deposit rate just got cut 0.25 points to 2.75%, and the refinancing rate was slashed 0.40 points to 3.60%. 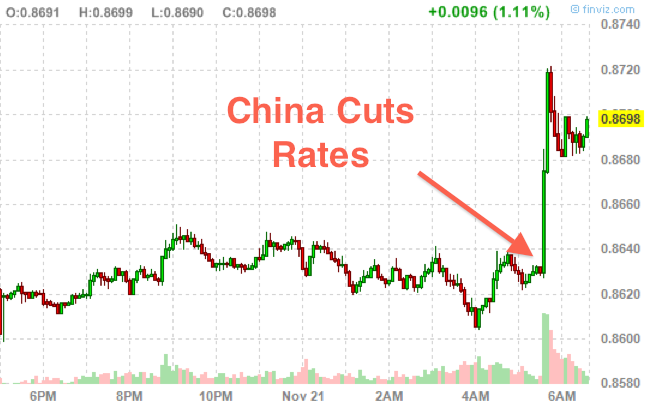 As you can see to right, the Aussie dollar — a proxy for the Chinese economy — made a huge move. Both of Friday’s actions come in the wake of accumulating signs of deterioration in the European economy and the deceleration in the Chinese economy. “China’s once-famous growth rates have dropped, and the government is now pursuing a 7.5% annual rise in GDP. Some economists think even that rate is unrealistic,” Business Insider’s Mike Bird noted. Societe Generale analysts note that this may not be the end of it either. For now, markets are ripping higher.